We note that Godfrey Bloom - serial idiot, drunkard, womaniser and user of prostitutes - was the only one who could be persuaded to publicly support his Fuhrer. Many will recall how close Godders & Nigel are doing most things together. 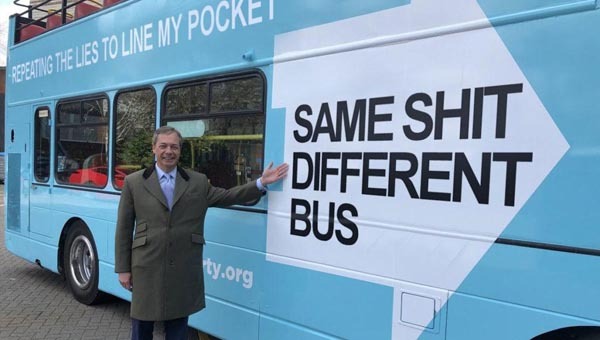 Some may will recall the cowardly way in which a third party was used by Nigel Farage to fire AND remove the UKIP Head of Research and MEP candidate Dr. Richard North so as to place the bufoon Godfrey Bloom as an MEP. Throughout the history of UKIP sound and competent men and women have found themselves removed or villified to make way for fools, sycophants and low lifes whom Farage can manipulate. Clearly the stables have forced the race horses out to pasture and piled the ordure centrally as a platform from which UKIP's poppinjay could crow! It has been ensured there is no one of gravitas, competence, honesty, probity or integrity within at least the top 50 places in this little party who is visibly a leader THEY HAVE DEPARTED IN DISGUST over the years. I very much doubt UKIP can be saved other than to continue as a Milch Cow to enrich a corrupt claque. Though it is still worthy trying as it is the ONLY current vehicle to Leave-The-EU.